Pakistan may deny the hand of the ISI and terror groups based on its soil behind the recent Mumbai train blasts but India today said that it would provide Pakistan with evidence to prove the same. Do you think the teachings of Mahatma Gandhi are still valid? 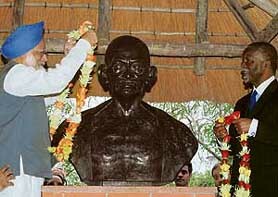 On the eve of Gandhi Jayanti, it was a momentous occasion for the Prime Minister, Dr Manmohan Singh, to visit the small four-room house in the Phoenix settlement, half an hour’s drive from Durban, where Mahatma Gandhi stayed with his family. A cadet at the Indian Military Academy committed suicide on its 74th Raising Day, the police said today. The body of Devendra Kumar Sharma, who hailed from the Kandaghat area in Solan district of Himachal Pradesh, was found hanging from a ceiling fan in his room at 6 am. 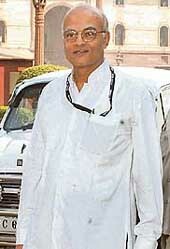 He was a member of the Siachen Batallion of the IMA. Admitting that the Capital was under the grip of deadly dengue, Delhi Health Minister Yoganand Shastri today said despite more than 100 cases added in the last one week itself there was no cause for panic. The Municipal Corporation of Delhi today booked eight city hospitals for not maintaining cleanliness in the midst of a dengue outbreak in the capital that has claimed 11 lives. National Conference chief patron Farooq Abdullah has said that he will meet President A.P.J. Abdul Kalam to seek mercy for Mohammad Afzal Guru, if Jammu and Kashmir Chief Minister Ghulam Nabi Azad leads the regional voice. The Election Commission on Thursday announced the byelection for the Vidisha parliamentary seat in Madhya Pradesh and four Assembly seats on October 30. A leading London daily today claimed that credit card data, along with passport and driving licence numbers, are being stolen from call centres in India and sold to the highest bidder. “Middlemen are offering bulk packages of tens of thousands of credit card numbers for sale.